Life hasn’t been easy for Stella. The small kitten with scruffy fur and matching orange-tinted eyes was born in September and still has no home. Just months ago, Stella’s mother was living near a park in Kawasaki with neither food nor shelter. With winter looming, the days growing shorter and bitter winds picking up, it was all but certain that she wouldn’t survive until the new year. But just as the sun was setting on this resilient mother, Yuri Ishii came to the rescue. After receiving a report in August that a pregnant cat had been seen wandering in a park, Ishii got into her car — a vehicle she affectionately refers to as the “cat taxi” — and took custody of the mother-to-be. Days later, the cat gave birth to four healthy kittens, including Stella. 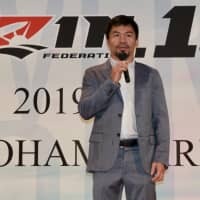 Ishii is a volunteer for Nekoken, a nonprofit organization founded in 2011 working to reduce and eventually eliminate the number of dogs and cats abandoned or put to death. Twice a month, the group hosts an adoption fair, where volunteers with foster animals bring them to interact with potential adopters. Ishii brought Stella and her siblings to one such event in Tokyo’s Nerima Ward, where they joined 40 other cats looking for new homes. Most came from an animal shelter; others were abandoned. Some — like Stella — were born without a home or owner. 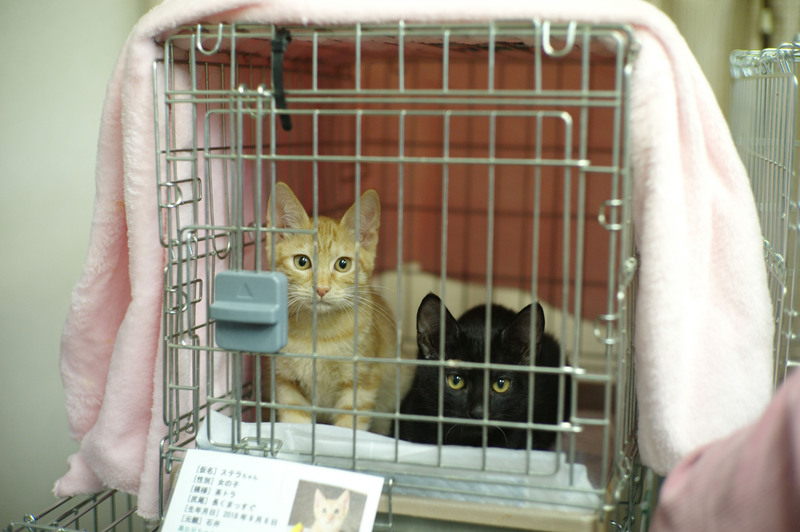 In 2016, Mizokami started 560 Group, an umbrella association under which Nekoken operates alongside two other organizations: 560 Shopping, an online retail company that sells goods and healthy pet food at a reduced cost, and Nekoken Animal Hospital, which neuters dogs and cats at no cost for pet owners who can’t afford the procedures. According to the Japan Pet Food Association, as of October there were an estimated 8.9 million domesticated dogs nationwide, down from 9.7 million in 2014, and 9.6 million domesticated cats, up from 9.5 million in 2014. The number of dogs and cats put down has been on a steady decline over the past decade — the figure was about 43,000 in fiscal 2017, down from some 299,000 in fiscal 2007. Still, 8,362 dogs and 34,854 cats were put to death in fiscal 2017, according to the Environment Ministry. The root of the problem, Mizokami says, is that pet owners aren’t neutering their cats and dogs. Within a few months, two cats can become seven or eight, and it can snowball from there. As the number grows, embarrassed owners remain silent for fear of the judgement they might face for letting things get out of hand. 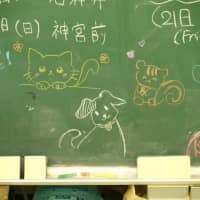 Still, Mizokami is encouraged by the growing number of people looking to adopt cats and dogs from organizations like hers. She says more people are realizing that animals can be adopted from rescue shelters, not just high-end pet shops. 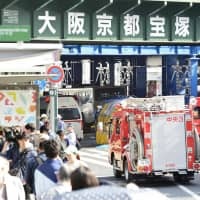 The issue has also struck a chord with younger people, with more becoming active in animal welfare, according to Julie Okamoto, a teacher at Yamate Gakuin Junior and Senior High School in Yokohama’s Sakae Ward, where she has been teaching for 34 years. 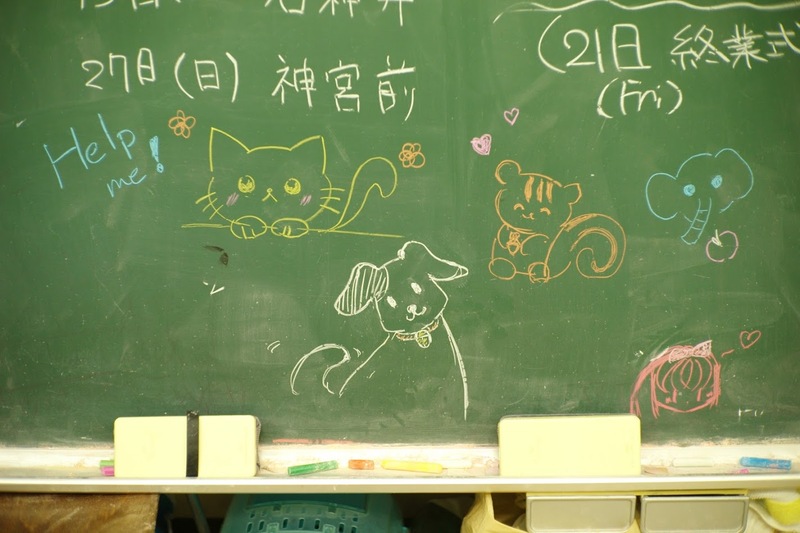 In 2002, Okamoto started Nekorobu, a school club in which students gather twice a week to make flyers and knit scarves to sell at events such as the school’s annual festival and bazaar, with the funds raised by the club going to local animal charities. 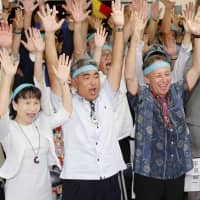 “It’s very nice seeing younger people take an interest in animal welfare,” said Okamoto, who is also a board member of Animal Refuge Kansai, a nonprofit organization that helps dogs and cats find homes. The organization, founded in Osaka in 1990, opened a Tokyo branch about 13 years ago. 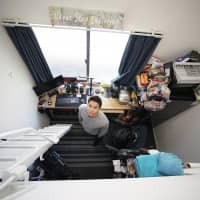 ARK has two properties — one each in Osaka and Hyogo prefectures — that can accommodate some 400 animals until a home is found for them. Okamoto said cats there are never put into cages while dogs spend much of their days frolicking in a grassy field or playing in a nearby river. Since they try not to accept dogs or cats from pounds, ARK receives most of its animals from owners who can no longer care for their pets. In most cases, if ARK doesn’t take in the animals, they most likely end up in shelters or abandoned, according to Okamoto. This time of year keeps the organization particularly busy, she added, noting that more animals are abandoned in the winter because people often buy puppies and kittens without being fully aware of the commitment needed to raise them. When an animal is taken in by ARK, it is neutered and vaccinated before being placed with a foster family that will take care of it until a suitable permanent home is found. The Johanssons are one such family. 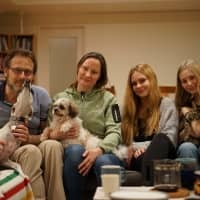 Germund and Veronica Johansson and their daughters, Ebba and Nora, began fostering animals with ARK about three years ago. Thanks to such families, ARK has been able to find homes for more than 3,200 dogs and 1,300 cats since they began keeping records in 1991. 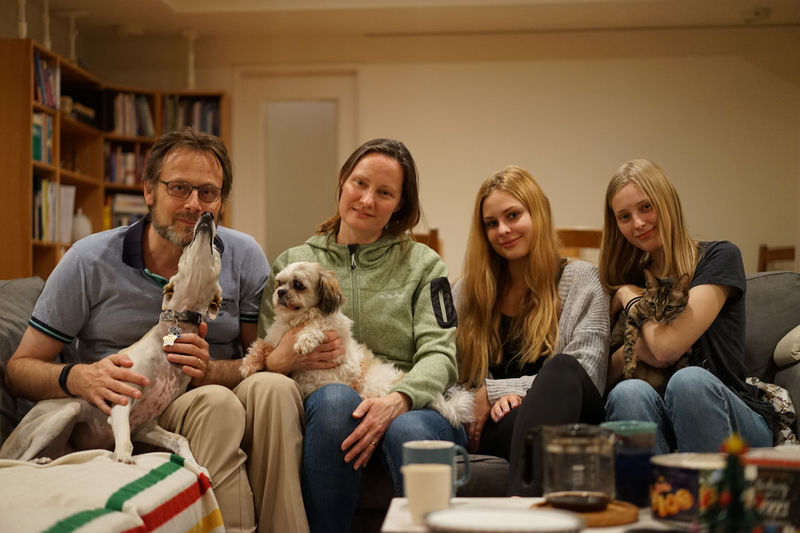 The Johanssons live in a spacious home in Yokohama’s Naka Ward with their dog, Yama, and cat, Lilly, both of which were once foster animals. Yama, a 7-year-old whippet — a thin breed commonly used in dog races — is quite the celebrity, having been featured in calendars, commercials and on the package of a dog food brand. Lilly, their 1-year-old cat, spends most of her time underneath the living room couch swiping at the feet of unwitting guests and inquisitive reporters. “Her hobbies include biting noses and cables,” Nora said. At the moment, the family is also taking care of an 11-year-old dog named Stromboli, who, depending on which daughter you ask, was named after an Italian dish or a small island volcano off the north coast of Sicily. Before moving to Yokohama, the Johanssons lived in Zurich. They’re probably going to move back next year. When they do, Yama and Lilly will, of course, go with them. Asked what they enjoy most about living with pets, each of them had a different answer. Nora said their presence helps relieve stress. Germund joked that the animals are basically therapists. Ebba said Yama helped her overcome her fear of dogs.